We have made a special purchase of ultra high quality aerospace type 100W broadband dielectric. Although we have only been able to test it up to 40W (the biggest laser we have), this mirror is the best we have ever seen at any price. 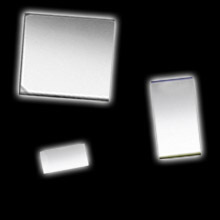 If you are good at cutting thin glass stock, check out our bulk mirror prices, and save big! Not responsible for mirror stock shattered while attempting to cut. High quality broadband beam splitter which comes in many different power levels: 25/75, 30/70, 50/50, 70/30, 75/25. These are custom cut when ordered and make sure to specify which power level you need.